A week or so after Kasparov's release, we are sitting in Moscow's Cosmos Hotel, where he is taking part in a human-rights meeting. Assembled is a ragtag group of Russian activists, and here Kasparov is a star. (Even here his two bodyguards sandwich him whenever he walks about.) Unlike many of Putin's other critics, who seem fearful of chastising their leader openly, Kasparov isn't cowed. "Putin wants to rule like Stalin but live like Abramovich," he says, referring to Roman Abramovich, the billionaire Russian oil trader who owns London's Chelsea soccer team. 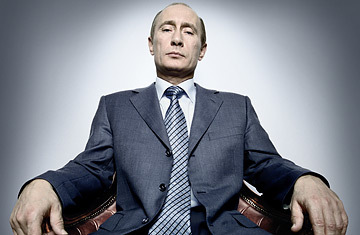 "Putin's system is more like Mafia than democracy." Putin's administration has blocked democrats like Kasparov from participating effectively in politics by making it all but impossible for them to meet the entry requirements. The President, in our discussion, routinely suggests that Kasparov is a stooge of the West because he spoke to the foreign press in English after his arrest. "If you aspire to be a leader of your own country, you must speak your own language, for God's sake," he says. Kasparov recently gave up his long-shot race for President. Dmitri Muratov also knows the difficulties of life in the Putin era. A softspoken, heavyset man whose neatly trimmed beard is turning gray, Muratov is the editor in chief of Novaya Gazeta, a Moscow newspaper, published twice a week, with a reputation for pursuing tough investigative pieces. In the past seven years, three of his journalists have been murdered; all were looking into corruption and wrongdoing. After the third murder, Muratov decided to close the 14-year-old paper to avoid putting any other journalist at risk. But his staff talked him out of it. The paper is perpetually harassed by officials around the country, but, Muratov notes with a weary smile, "we're still alive." Muratov, for his part, doesn't know who ordered his journalists' killings. He says only that he blames "corruption," which has flourished during Putin's eight years. Although few Russians seem to think Putin himself is corrupt, it is commonly believed that he is surrounded by business and political heavies who are amassing millions in payoffs. Indeed, if anything can bring him down, it may well be graft. As long as living standards rise, people are more likely to forgive the perception that officials are getting obscenely rich by demanding illicit payoffs. But if the economy stops growingif the price of oil falls back to earthPutin will face a challenge, whether from the masses in the streets or from military and civilian challengers. One insider, who asked that his identity be protected, spelled out for us just one example of how the game is played, detailing the payments a prospective regional governor has to make to political bagmen in Moscow in order to get the Kremlin's nod for the post. For wealthier regions, such an endorsement can cost as much as $20 million, money that the politicians raise quietly from corporate "sponsors" that expect special treatment in return. The amount of money flowing to kingmakers in the Kremlin, in other words, is staggering. When we ask about the view that he is surrounded by corrupt officials, Putin turns testy: "If you are so confident, then I presume you know the names and the systems and the tools...Write to us." As for Politkovskaya, who had been investigating policy failures and human-rights abuses in Chechnya when she was killedand who authored the 2004 book Putin's Russia: Life in a Failing DemocracyPutin says he believes she was murdered by a provocateur to cast suspicion on his administration.